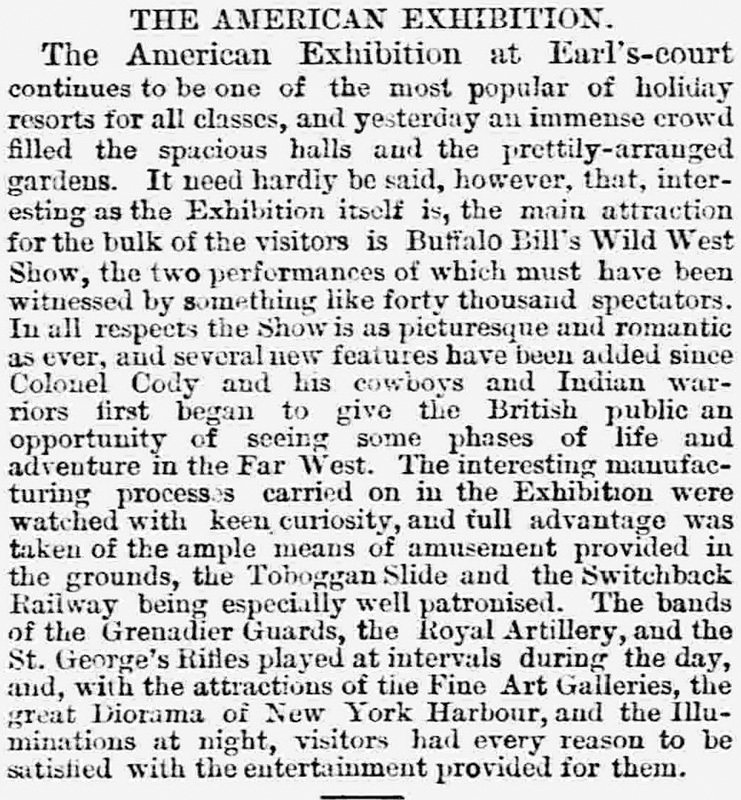 The American Exhibition at Earl's-court continues to be one of the most popular of holiday resorts for all classes, and yesterday an immense crowd filled the spacious halls and the prettily-arranged gardens. 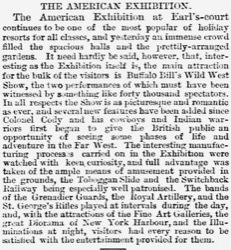 It need hardly be said, however, that, interesting as the Exhibition itself is, the main attraction for the bulk of the visitors is Buffalo Bill's Wild West Show, the two performances of which must have been witnessed by something like forty thousand spectators. In all respects the Show is as picturesque and romantic as ever, and several new features have been added since Colonel Cody and his cowboys and Indian warriors first began to give the British public an opportunity of seeing some phases of life and adventure in the Far West. The interesting manufacturing processes carried on in the Exhibition were watched with keen curiosity, and full advantage was taken of the ample means of amusement provided in the grounds, the Toboggan Slide and the Switchback Railway being especially well patronised. The bands of the Grenadier Guards, the Royal Artillery, and the St. George's Rifles played at intervals during the day, and, with the attractions of the Fine Art Galleries, the great Diorama of New York Harbour, and the Illuminations at night, visitors had every reason to be satisfied with the entertainment provided for them.